If you love sweet romances (PG-rating), look no further than Rachelle Ayala's Have a Hart Romance series. The Harts are a family of San Francisco firefighters. Their family motto is: Heart comes first. Larry's not sure he belongs in a fashion show and balks at being her good deed. Can Jenna convince Larry beauty is never skin deep and love's arrow strikes not only the beautiful, but the bold? You don’t have to read book 1 to enjoy this sweet romance. It was a nice fresh contemporary tale of beauty and the beast… with dogs. Jenna (the beauty ) wasn’t my favorite in the beginning. She was a loff but luckily she grew on me. The author really dug deep with these characters and develops them well. Larry was a different story, I connected with him immediately. He was ‘the beast’ being disfigured when he was a firefighter. Sometimes opposites really do attract. This was my first book by Rachelle Ayala and it will not be my last. A feel good sweet love story! A feel good sweet love story! Reading this story will make your heart leap with joy and have you believing that there is true love waiting just for you and to never give up. Coming from a family of firefighters this story really perked my interest. Who knew that it would grip my heart as well. Most people never understand the dangers that a firefighter goes through or how it can change their lives not only physically but mentally as well. This story touched on how Larry not only carried physical scars but mental scars as well. Larry has the passion and true heart of a firefighter – doing the job he loves no matter the risk. Larry had a heart of gold and would make the perfect man for someone willing to see past his scars and see his caring heart. On the outside Jenna appears to be a typical fashion designer who is willing to do anything to get ahead in her business. To help her along, Jenna felt she needed to use a hound dog to “bribe” her brother, the fire chief, to help her with her latest job. She was determined to succeed however in the end would she let it cost her the love that she has found or will she let love lead her in a different direction? I loved the touch of the hound dog. He gave you the feel good emotions and added just the right amount of cuteness to the story. He might not be a good station dog but he is certainly good as a cute companion. One thing this book can teach you is that beauty comes from within; it is your character and heart. The story has all sorts of emotions that will pull on your heart strings. Rachelle Ayala has a way of spinning a story around your emotions and drawing you in to the very end. I recommend Rachelle Ayala to anyone that is looking for a feel good sweet romance that will pull out your emotions and leave you wanting to read more. Serious subjects delivered with humor, heart and wisdom. Ms. Ayala is good at her craft. Her ability to deliver a story that has every element from laughter, to drama and optimism is one of the reasons I have become a fan. Larry, Jenna and a matchmaking pooch make for a charming combination. 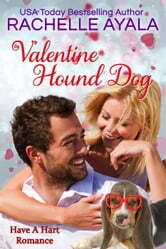 Valentine Hound Dog imparts a beautiful lesson in a light heartwarming way. Beauty is the culmination of heart, body and soul not flaws on the outer shell but the light that shines from within. I lost a piece of my heart within this cute tale.